The module comes shipped with 3 banks of 64 ëbasicí waveforms (192 total). Each bank of 64 waves is arraigned in memory as an 8 x8 array (like a chess board). The ërowsí are called ëthe X directioní and the columns are ëthe Y directioní. The 2 panel controls and the 2 external control voltages (MORPH X and MORPH Y) are used to ìpointî to where in the array we use for the data that is the XY OUT. The third control voltage is called ëZ MORPHí, and it determines the waveshape at the Z OUT. The Z control voltage ëscansí then wavetable bank from wave #1 (think as Row 1, Column 1) to wave #64 (Row 8, column 8). For example: if X MORPH is set to 2, and Y MORPH is set to 5, the signal at XY OUT is the waveform stored at Row 2, Column 5 (the 13th wavetable). 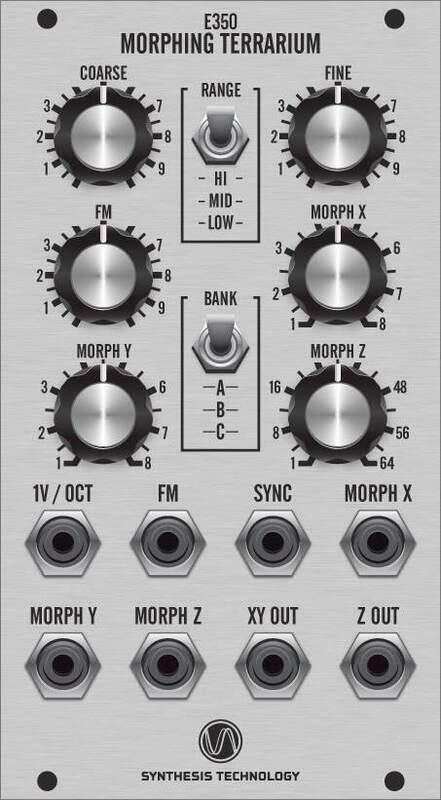 The Z OUT is completely independent of XY OUT, so if the MORPH Z knob is at 48, then the 48th wavetable (Row 6, Column 8) is the output. But we were not content with just indexing through the table 1 wave at a time. Instead, the E350 implements a proprietary smoothing/anti-aliasing algorithm that allows the 2 outputs to be a continuous blending of one wave to another. The algorithm calculates 128 ìin-betweenî waveforms, so that the 192 ëbasicí waveforms are really expanded to over 24 *thousand* individual timbres! 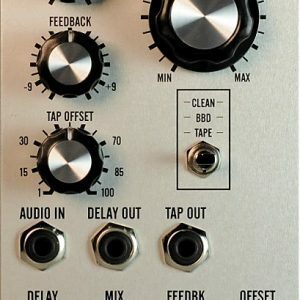 So as you adjust the panel controls, or add external modulation (from LFOs, EG, etc) the E350ís outputs are ìglitch-freeî and will provide you with a near infinite range of tonal possibilities. For people that like the glitches of older wavetable VCOs, there is a jumper option on the pc board to add these back in. But, we wanted to do more, so we added a 3-position Range switch for using the E350 as the worldís best LFO. At the lowest setting, the E350 will cycle once every 13 minutes and be repeatable within 20usec. The SYNC signal can be used to reset both outputs to zero (ëhard syncí) like any other VCO. 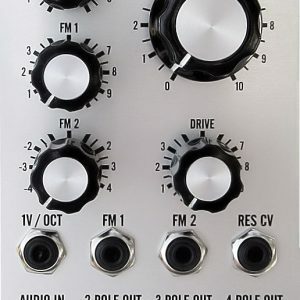 The ëCí bank of waveforms are specifically designed to be used in LFO settings (although they will output audio timbres as well). The LFO waveshapes are everything from ëchirpsí, sequences of individual notes to noise gates, S&H effects to exponential/log sweeps. Like quadrature outputs? The E350 can have variable phase outputs under CV control. There is nothing like the E350 in any modular format. In many patches a VCF is not needed: the timbres that are generated are already smooth and harmonically ìcorrectî. From the precise tracking to over 24,000 waveforms possible, the E350 sets the standard in modular oscillators. The module ships with three banks of 64 “basic” waveforms (192 total). Each bank of 64 waves is arranged in memory as an 8×8 array (like a chess board). The “rows” are the X direction and the columns are the Y direction. The two panel controls and the two external control voltages (Morph X and Morph Y) are used to “point” to where in the array we use for the signal that is available at the XY Out. The third control voltage is called Z Morph, which determines the waveshape at the Z Out. The Z control voltage scans the wavetable bank from wave #1 (think as row 1, column 1) to wave #64 (row 8, column 8). For example, if Morph X is set to 2, and Morph Y is set to 5, the signal at the XY Out is the waveform stored at row 2, column 5 (the 13th wavetable). 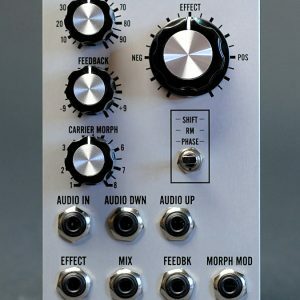 The Z Out is completely independent of the XY Out, so if the Morph Z knob is at 48, then the 48th wavetable (row 6, column 8) is the output. But we were not content with just indexing through the table one wave at a time. Instead, the E350 implements a proprietary smoothing/anti-aliasing algorithm that allows the two outputs to be a continuous blending of one wave to another. The algorithm calculates 128 “in-between” waveforms, so that the 192 “basic” waveforms are really expanded to over 24,000 individual timbres! As you adjust the panel controls, or add external modulation (from LFOs, envelopes, etc. ), the E350’s outputs are “glitch-free” and will provide you with a near-infinite range of tonal possibilities. If you like the glitches of older wavetable VCOs, there is a jumper option on the PCB to restore this behavior. But we wanted to do even more, so we added a three-position range switch for using the E350 as the world’s best LFO. At the lowest setting, the E350 will cycle once every 13 minutes and be repeatable within 20μsec. The Sync signal can be used to reset both outputs to zero (hard sync) like any other VCO. The C bank of waveforms are specifically designed to be used in LFO settings (although they will output audio timbres as well). The LFO waveshapes include everything from ‘chirps,’ to sequences of individual notes, to noise gates, to sample & hold effects, to exponential/logarithmic sweeps. Like quadrature outputs? The E350 can have variable phase outputs under CV control. There is nothing like the E350 in any modular format. 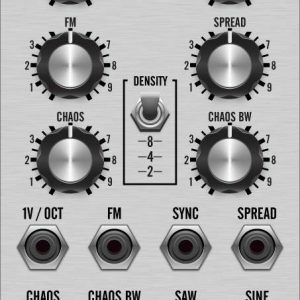 In many patches a VCF is not needed because the timbres that are generated are already smooth and harmonically “correct.” From the precise tracking to the incredible 24,000 possible waveforms, the E350 sets the standard in modular oscillators.